Can you imagine if we were forced to ration in 2008? During the war, goods were scarce: The basics, such as metal, rubber, sugar, and butter were carefully rationed. Everyday items, such as shoes, were nearly impossible to obtain, and the ration book helped spread basic goods around. 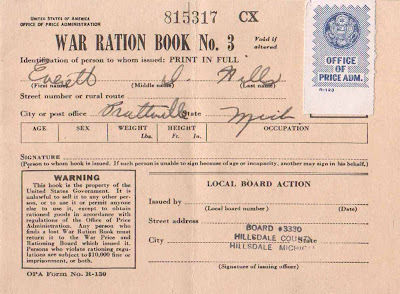 Yet, according to my late grandmother, people willingly accepted rationing as a necessary part of the war effort. I can't imagine having to do without; I come from the boomer generation, a group used to having what it wants, when it wants it. 1. This book is valuable. Do not lose it. 2. 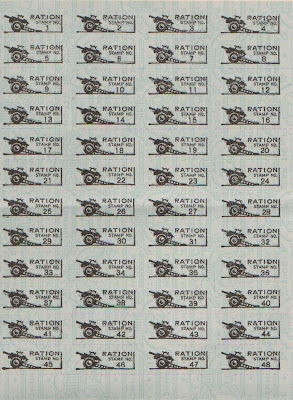 Each stamp authorizes you to purchase rationed goods in the quantities and at the times designated by the Office of Price Administration. Without the stamps, you will be unable to purchase those goods. 3. Detailed instructions concerning the use of this book and the stamps will be issued. Watch for those instructions so that you will know how to use your book and stamps. Your Local War Price and Rationing Board can give you full instructions. 4. Do not throw this book away when all of the stamps have been used, or when the time for their use has expired. You may be required to present this book when you apply for subsequent books. Rationing is a vital part of your country's war effort. Any attempt to violate the rules is an effort to deny someone his share and will create hardship and help the enemy. 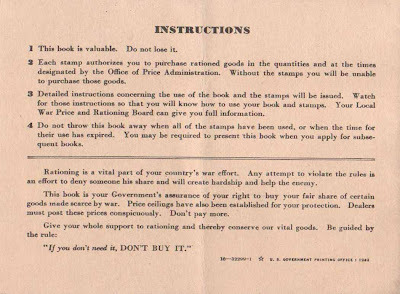 This book is your Government's assurance of your right to buy your fair share of certain goods made scarce by the war. Price ceilings have also been established for your protection. Dealers must post these prices conspicuously. Don't pay more. If you don't need it, DON'T BUY IT." Please feel free to post your comments about rationing, especially if you were around back then or if your parents or grandparents told you any interesting stories. What was it like having to stretch resources?